Leaf has thrown down the gauntlet for collectors, offering up to $20,000 cash for building several limited insert sets from the recently released 2011 Leaf Muhammad Ali Metal. They're also awarding smaller bounties for completing individual sets. Red Prismatic Base Set (100 cards, /10): $1,000 for each of the first three sets submitted. Red Prismatic Fans/Associate/Family Autograph Set (18 cards, /5): 1,000 for each set submitted. Red Prismatic Fight-Worn Set (35 cards, /2): $5,000 for each set submitted. Red Prismatic Training-Worn Set (35 cards, /3): $2,500 for the first set, $1,500 for the second set submitted. Red Prismatic Event-Worn Set (35 cards, /5): $1,500 for the first set, $1,000 for the second set submitted. 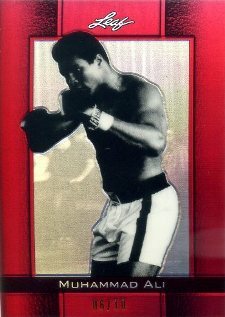 Red Prismatic Muhammad Ali Cut Set (10 cards, /5): $1,500 for the first set, $1,000 for each additional set submitted. Finally, Leaf is offering $20,000 to the first collector who submits all six qualifying sets, but they must do it all at once. Collectors can submit the cards to Leaf either by UPS, in-person at an event Leaf is scheduled to appear at or by special appointment. Once verified, cards will be returned to collectors and bounties will be paid. Leaf will be cataloging submitted cards and posting them online, so they can't be used on multiple submissions. The deadline to submit cards is February 1, 2012. This is a unique promotion that should certainly spur interest in the high-end set. Given the extremely limited nature of some of these inserts, it's going to take more than a deep wallet to complete them. Collectors will need to be both lucky and resourceful, particularly if they're going for the top prize. It's not the first time a card company has offered collectors cash for building sets. Some might recall when Topps offered a $125 guarantee on their Bowman Baseball sets a little more than a decade ago. The premise was that collectors could register their sets and for $5 get an insurance policy of sorts. If, after a few years, a collector wanted to sell Topps their completed Bowman sets, the company would buy them back for $125. This time, the stakes are much higher and collectors get to keep their cards.